Fig. 22 Competitive strategy. Three generic strategies. (Source: Michael Porter). Fig. 21 Competitive strategy. Forces driving competition in a market. (Source: Michael Porter). establishing, operationally, a position of COMPETITIVE ADVANTAGE which makes the firm less vulnerable to attack from established competitors and potential new entrants, and to erosion from the direction of buyers, suppliers and substitute products. There are three generic strategies for competitive success (Fig. 22): cost leadership, product differentiation and ‘focus’. Low costs, particularly in commodity-type markets, help the firm not only to survive price competition should it break out, but, importantly, enable it to assume the role of market leader in establishing price levels which ensure high and stable levels of market profitability. The sources of cost-effectiveness are varied, including the exploitation of ECONOMIES OF SCALE, investment in best state-of-the-art technology (e.g. COMPUTER-AIDED MANUFACTURING, LEAN MANUFACTURING) and preferential access to raw materials or distribution channels. By adopting a PRODUCT DIFFERENTIATION strategy a firm seeks to be unique in its market in a way that is valued by its potential customers. Product differentiation possibilities vary from market to market but are associated with the potential for distinguishing products by their physical properties and attributes and the experience of satisfaction – real and psychological – imparted by the product to consumers. General cost leadership and differentiation strategies seek to establish a COMPETITIVE ADVANTAGE over rival suppliers across the whole market. By contrast, ‘focus’ strategies aim to build competitive advantages in narrower segments of a market, but again either in terms of cost or, more usually, differentiation characteristics, with ‘niche’ suppliers primarily catering for speciality product demands. See VALUE ADDED MODEL, MARKET STRUCTURE, MARKET CONDUCT, MARKET PERFORMANCE, STRATEGIC GROUP. Fig. 27 Competitive strategy. (a) Forces driving competition in a market. (b) Three generic strategies. Source: Michael Porter. establishing, operationally, a position of COMPETITIVE ADVANTAGE that makes the firm less vulnerable to attack from established competitors and potential new entrants, and to erosion from the direction of buyers, suppliers and substitute products. There are three generic strategies for competitive success (Fig. 27 (b)): cost leadership, product differentiation and ‘focus’. Low costs, particularly in commodity-type markets, help the firm not only to survive price competition should it break out but, importantly, enable it to assume the role of market leader in establishing price levels that ensure high and stable levels of market profitability The sources of cost-effectiveness are varied, including the exploitation of ECONOMIES OF SCALE, investment in best state-of-the-art technology and preferential access to raw materials or distribution channels. By adopting a PRODUCT DIFFERENTIATION strategy, a firm seeks to be unique in its market in a way that is valued by its potential customers. Product differentiation possibilities vary from market to market but are associated with the potential for distinguishing products by their physical properties and attributes and the experience of satisfaction - real and psychological -imparted by the product to consumers. General cost leadership and differentiation strategies seek to establish a COMPETITIVE ADVANTAGE over rival suppliers across the whole market. 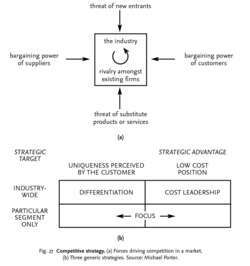 By contrast, ‘focus’ strategies aim to build competitive advantages in narrower segments of a market but, again, either in terms of cost or, more usually, differentiation characteristics, with ‘niche’ suppliers primarily catering for speciality product demands. See MARKET STRUCTURE, MARKET CONDUCT, MARKET PERFORMANCE, RESOURCE-BASED THEORY OF THE FIRM. It aptly states that to have an excellent supply chain, which I define as a competitive supply chain, it must be strategically aligned to the corporate competitive strategy. The results identified various factors that can impede alignment of low-cost competitive strategy with the competitive cost priority. Barry Watt's final chapter of the section provides crystallization on why competitive strategy is so difficult to implement. CG bagged the prestigious 2014 Frost & Sullivan Southeast Asia Competitive Strategy Innovation & Leadership Award in the HV Power Transmission Market category. Similar to other research handbooks, this volume represents an effort to survey the state of the art in competitive strategy research, however editor Dagnino (U.
David La Piana is the author of PLAY TO WIN: The Nonprofit Guide to Competitive Strategy released in February 2005 by Caroline O'Connell Communications. Prof Porter is widely acknowledged as the world's leading authority on competitive strategy. In the years to come, sourcing strategy will be increasingly indistinguishable from competitive strategy. Managing capacity for effectiveness means that each foundry's business plan and competitive strategy should drive the scope and nature of its capital investments. Prof Michael Porter is the world's leading authority on competitive strategy. Personal selling is--or at least should be--a critical component in the long-term competitive strategy for most, if not all, firms.